Do you find yourself working or meeting at local cafés and coffee shops? Are you craving a community of dynamic, successful women to be inspired by? If so, a Drop-in membership at RISE Collaborative is for you. Our open collaborative space is a more professional version of a café, where you can conduct business and build lasting connections that will take your professional and personal life to the next level. To build a strong community: * is a 6-month commitment, ** is a 1 year commitment. 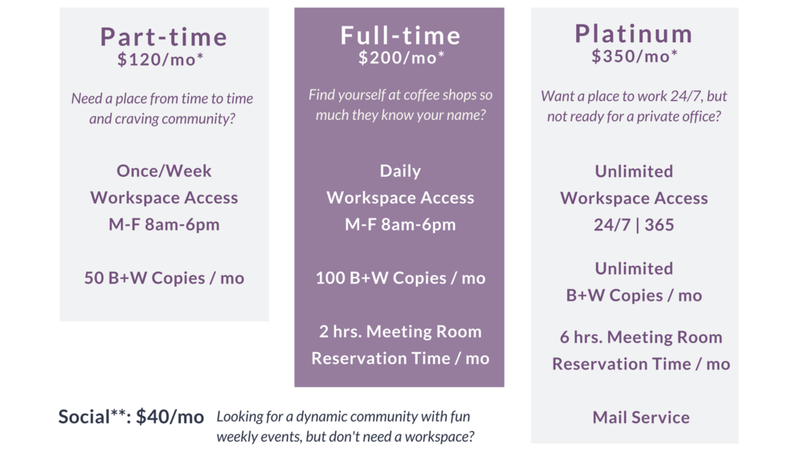 There is a one-time registration fee of $40 dollars for social and part-time memberships and $60 for full-time and platinum. This prestigious and centrally located co-working space in the Ladue/Clayton corridor boasts 11 private offices with conference rooms, coffee bar, reception desk, parking and more. All of our private offices are occupied at this time. Please contact us to be placed on our waitlist. For information on office floor plans and pricing, please click below. Please read our Prospective Member Policy before applying. We review applications regularly and you will hear back from us within 5 business days.